After making yesterday’s muffins, I felt the need to try a lower sugar, lower calorie version. 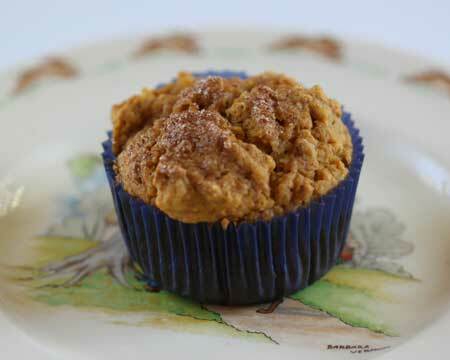 If artificial sweeteners aren’t your thing, these maple pumpkin muffins won’t be either. However, if you’ve been known to break out the Splenda, I’d be curious to see what you think. At first I thought they had too much of an aftertaste, but once I let the muffins cool off, the aftertaste dissipated a bit and the muffins tasted less floury and less sweet (in a good way). They’re not rich, dessert-like muffins, but they’d be good for breakfast or a snack. I just need some more opinions on the overall taste and texture, so if you try them let me know. My family thought they were good and couldn’t detect the aftertaste, but we all have different levels of sensitivity to that. I put my estimated calories in parenthesis and then divided it all by 8 to get muffins with about 137 calories each. The muffins weighed about 1.8 oz each, so they were still pretty dense. 2 teaspoon granulated sugar mixed with some cinnamon. Preheat oven to 400 degrees F. Line 8 muffin cups with paper liners. In a large bowl, combine the flour, baking powder, pumpkin pie spice and salt. Stir well, then stir in the Splenda blend and the crushed cereal. In a second bowl, combine the buttermilk, butter, syrup, pumpkin, egg white and vanilla. Stir into the dry ingredients just until moistened. Fill muffin cups two-thirds full. Sprinkle cinnamon sugar over the top. Bake for 16-18 minutes or until a toothpick inserted near the center comes out clean. Cool completely, because they seem to taste better that way. When warm, they taste a little flour and you can really taste the artificial sweetener, but at room temperature they’re pretty good. I have a tendency to keep the sugar real and replace the butter/margarine/oil with applesauce, or in this case you could probably use pumpkin puree with similar results :). This is something I’m pretty notorious for doing, and if I don’t mention it to my family as they’re scarfing it down, they would never know :). The only issue is that you’re going to lose the muffin top crust. Thank you for a sugar free alternative for those who can’t eat sugar, but want to indulge a little. It is too bad lower calorie items are not as popular (and many times not as good) as the rich desserts we crave…I did taste a processed-sugar free chocolate flourless torte…NOT fat free…and it was delicious!!! It must have been made with unsweetened chocolate, splenda, or truvia…and lots of butter!